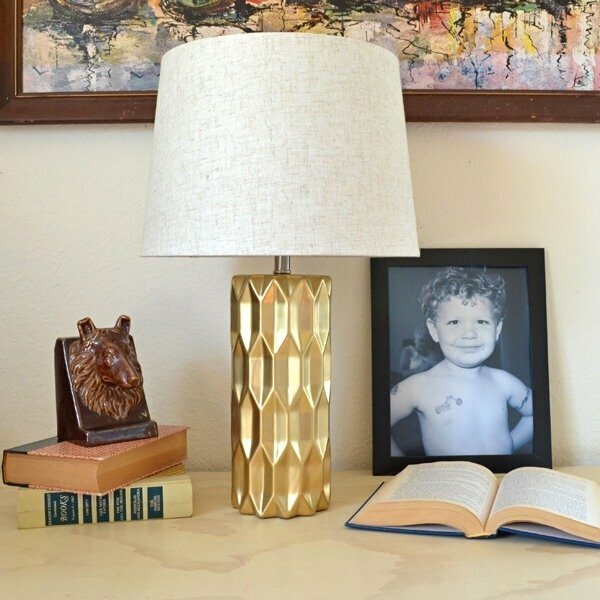 I had been jonesing for a gold faceted lamp for quite some time. I’d search online and come up with absolutely bupkis. Every search was an absolute bust. And then one day I found it. 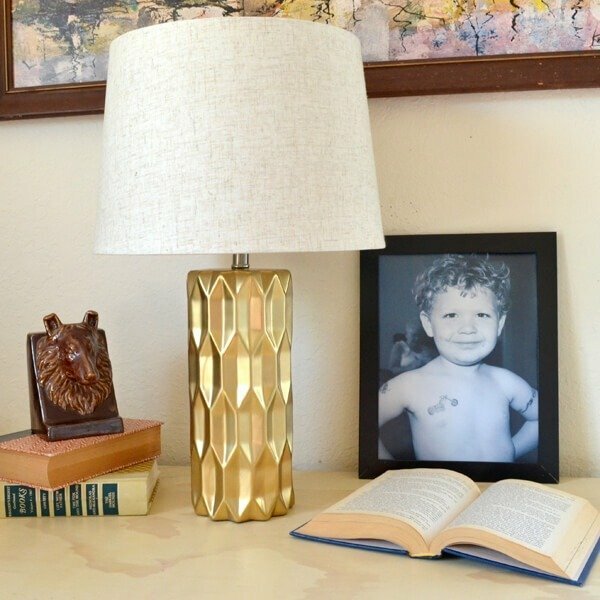 Lo and behold there was FINALLY a gold faceted lamp for sale. Unfortunately it was also 200 bucks which is waaaaaay too rich for my blood. You see I kind of have this rule where I don’t pay the same amount as a car payment for anything decorative that I’ll probably be over in a year. But I must admit, I was totally wavering when that sucker went on sale to $125. I could ALMOST rationalize it. But in the end, I was just too darn cheap. 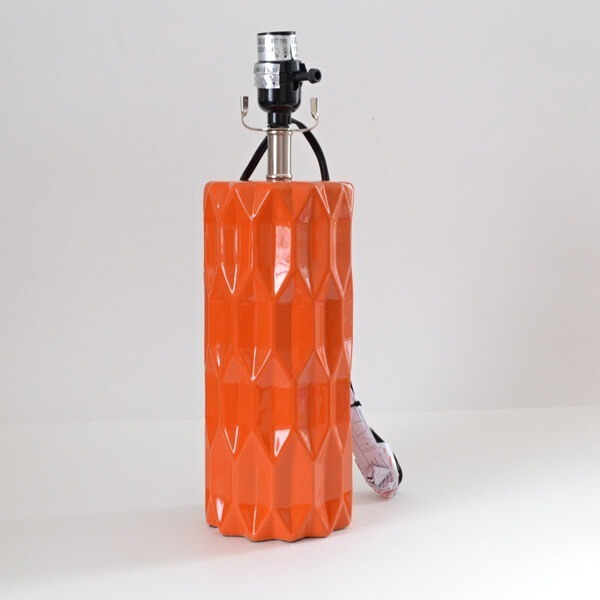 And then one day walking through Wal-Mart I happened to spy this orange lamp that stood out among all of the other white and gold and silver lighting that are vanilla enough that they can fit into just about every home. Maybe it was the fact that it was faceted (hurrah!) or perhaps it was the bright freaking orange that caught my attention, but either way I was homing in on it like nobody’s business. You see when I get into that frame of mind you’d better be cool with one word answers because the gears they are a turnin’ for something and it ain’t conversation. I got home and INSTANTLY started painting this thing. First a coat of primer. Now quick tip, I was told by a very nice fellow in customer service at a graffiti store that if you use a dark primer your metallic paints will have more pop when sprayed on top. Followed by two coats of my favorite gold spray paint. And there it is! That is seriously all there was to it. Find the lamp, prime it, paint it, have a nice day and save 170 big ones. For a total of $29. 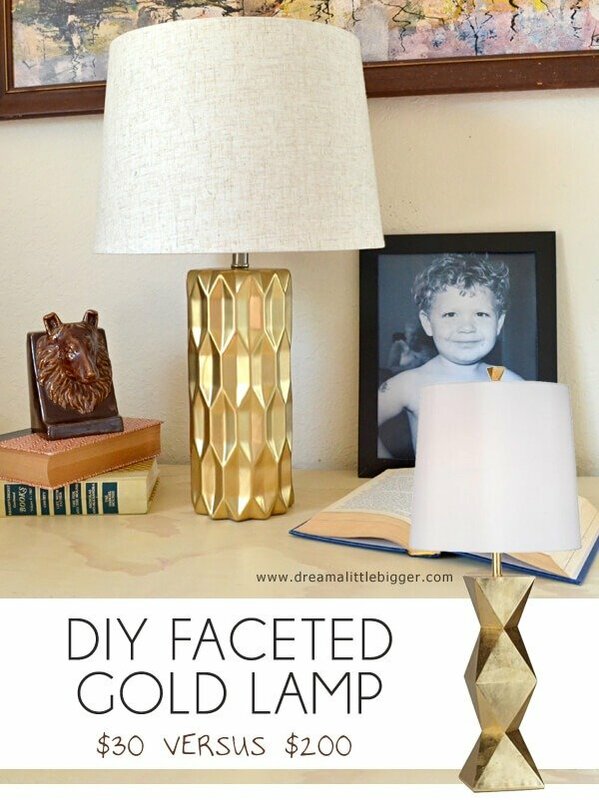 So keep those eyes peeled for your own perfectly faceted but poorly colored lamp and get on this decorative gold train that’s happening! Mom sprayed everything gold when I was little so don’t usually like gold spray painted things. But, your lamp is gorgeous. I think it’s prettier than the $200 lamp. Love the look, it looks better in gold than it did in orange. I like yours a LOT better! Nice job! What an amazing lamp. It is beautiful in its “gold” life, although, it was pretty amazing in its orange life. The facets do show up better with it being gold then they did orange. Enjoy your new lamp in good health!!! BTW, I am very jealous, lol!!! 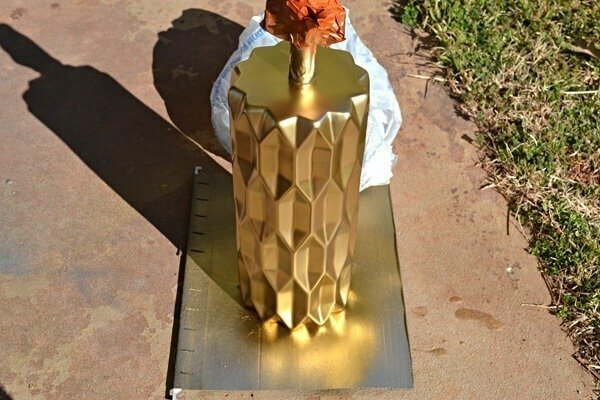 I spray paint everything gold! Great lamp. I love this! what spray paint did you use? If you could tell me the name of the primer and the gold, I’m doing a similar project and your gold looks amazing! 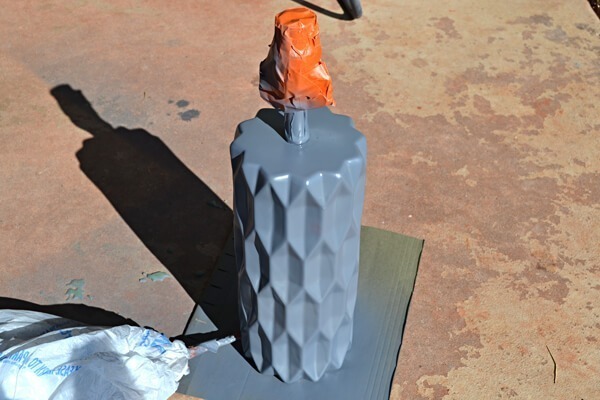 I use Rustoleum primer in gray and Rustoleum American Accents Bright Metallics, Gold! Which brand of spray paint do you use? Rustoleum! I believe I linked to the paint in the needed items list. Looks great! I have the same exact lamps, same orange color. I spray painted mine navy blue! What size lamp did you use? To be honest mine broke in a recent move. I was SO disappointed! I’m not sure at all what size it was but I’m glad you still have yours. 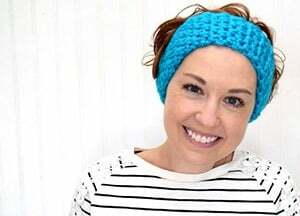 Navy sounds FAB!